Gymnosperms, meaning “naked seeds,” are a diverse group of seed plants. According to the “anthophyte” hypothesis, the angiosperms are a sister group of one group of gymnosperms (the Gnetales), which makes the gymnosperms a paraphyletic group. Paraphyletic groups are those in which not all descendants of a single common ancestor are included in the group. However , the “netifer” hypothesis suggests that the gnetophytes are sister to the conifers, making the gymnosperms monophyletic and sister to the angiosperms. Further molecular and anatomical studies may clarify these relationships. Characteristics of the gymnosperms include naked seeds, separate female and male gametes, pollination by wind, and tracheids (which transport water and solutes in the vascular system). Gymnosperm seeds are not enclosed in an ovary; rather, they are only partially sheltered by modified leaves called sporophylls. You may recall the term strobilus (plural = strobili) describes a tight arrangement of sporophylls around a central stalk, as seen in pine cones. Some seeds are enveloped by sporophyte tissues upon maturation. The layer of sporophyte tissue that surrounds the megasporangium, and later, the embryo, is called the integument. Gymnosperms were the dominant phylum in the Mesozoic era. They are adapted to live where fresh water is scarce during part of the year, or in the nitrogen-poor soil of a bog. Therefore, they are still the prominent phylum in the coniferous biome or taiga, where the evergreen conifers have a selective advantage in cold and dry weather. Evergreen conifers continue low levels of photosynthesis during the cold months, and are ready to take advantage of the first sunny days of spring. One disadvantage is that conifers are more susceptible than deciduous trees to leaf infestations because most conifers do not lose their leaves all at once. They cannot, therefore, shed parasites and restart with a fresh supply of leaves in spring. The life cycle of a gymnosperm involves alternation of generations, with a dominant sporophyte in which reduced male and female gametophytes reside. All gymnosperms are heterosporous. The male and female reproductive organs can form in cones or strobili. Male and female sporangia are produced either on the same plant, described as monoecious (“one home” or bisexual), or on separate plants, referred to as dioecious (“two homes” or unisexual) plants. The life cycle of a conifer will serve as our example of reproduction in gymnosperms. Pine trees are conifers (coniferous = cone bearing) and carry both male and female sporophylls on the same mature sporophyte. Therefore, they are monoecious plants. Like all gymnosperms, pines are heterosporous and generate two different types of spores (male microspores and female megaspores). Male and female spores develop in different strobili, with small male cones and larger female cones. In the male cones, or staminate cones, the microsporocytes undergo meiosis and the resultant haploid microspores give rise to male gametophytes or “pollen grains” by mitosis. Each pollen grain consists of just a few haploid cells enclosed in a tough wall reinforced with sporopollenin. In the spring, large amounts of yellow pollen are released and carried by the wind. Some gametophytes will land on a female cone. Pollination is defined as the initiation of pollen tube growth. The pollen tube develops slowly, and the generative cell in the pollen grain produces two haploid sperm or generative nuclei by mitosis. At fertilization, one of the haploid sperm nuclei will unite with the haploid nucleus of an egg cell. Female cones, or ovulate cones, contain two ovules per scale. Each ovule has a narrow passage that opens near the base of the sporophyll. This passage is the micropyle, through which a pollen tube will later grow. One megaspore mother cell, or megasporocyte, undergoes meiosis in each ovule. Three of the four cells break down; only a single surviving cell will develop into a female multicellular gametophyte, which encloses archegonia (an archegonium is a reproductive organ that contains a single large egg). As the female gametophyte begins to develop, a sticky pollination drop traps windblown pollen grains near the opening of the micropyle. A pollen tube is formed and grows toward the developing gametophyte. One of the generative or sperm nuclei from the pollen tube will enter the egg and fuse with the egg nucleus as the egg matures. Upon fertilization, the diploid egg will give rise to the embryo, which is enclosed in a seed coat of tissue from the parent plant. Although several eggs may be formed and even fertilized, there is usually a single surviving embryo in each ovule. 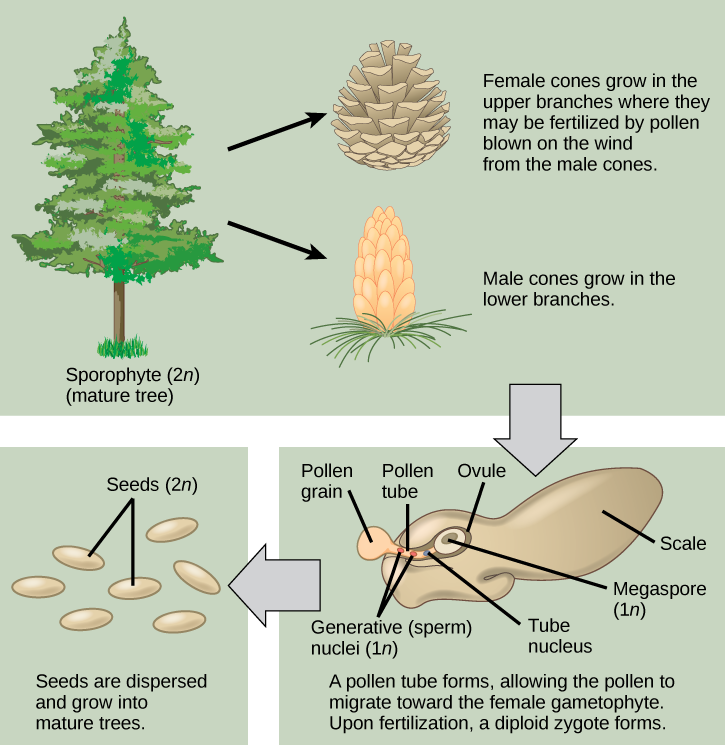 Fertilization and seed development is a long process in pine trees: it may take up to two years after pollination. The seed that is formed contains three generations of tissues: the seed coat that originates from the sporophyte tissue, the gametophyte tissue that will provide nutrients, and the embryo itself. (Figure) illustrates the life cycle of a conifer. The sporophyte (2n) phase is the longest phase in the life of a gymnosperm. The gametophytes (1n)—produced by microspores and megaspores—are reduced in size. It may take more than a year between pollination and fertilization while the pollen tube grows towards the growing female gametophyte (1n), which develops from a single megaspore. The slow growth of the pollen tube allows the female gametophyte time to produce eggs (1n). Conifer life cycle. This image shows the life cycle of a conifer. Pollen from male cones blows up into upper branches, where it fertilizes female cones. The megaspore shown in the image develops into the female gametophyte as the pollen tube slowly grows toward it, eventually fusing with the egg and delivering a male nucleus, which combines with the female nucleus of the mature egg. At what stage does the diploid zygote form? Watch this video to see the process of seed production in gymnosperms. Cycads thrive in mild climates, and are often mistaken for palms because of the shape of their large, compound leaves. 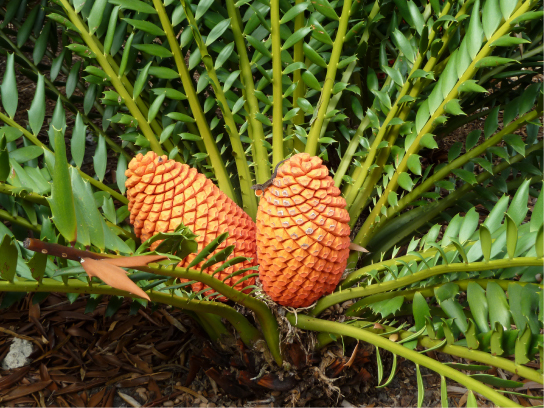 Cycads bear large strobili or cones ((Figure)), and may be pollinated by beetles rather than wind, which is unusual for a gymnosperm. Large cycads dominated the landscape during the age of dinosaurs in the Mesozoic, but only a hundred or so smaller species persisted to modern times. They face possible extinction, and several species are protected through international conventions. Because of their attractive shape, they are often used as ornamental plants in gardens in the tropics and subtropics. 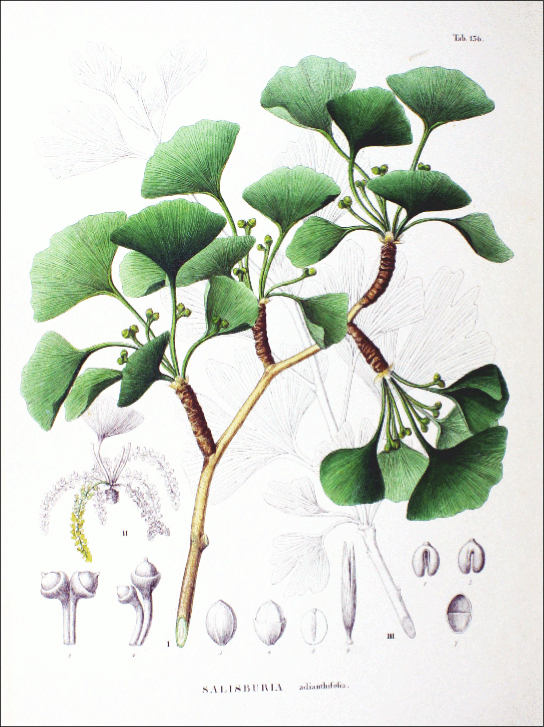 The single surviving species of the ginkgophytes group is Ginkgo biloba ((Figure)). Its fan-shaped leaves—unique among seed plants because they feature a dichotomous venation pattern—turn yellow in autumn and fall from the tree. For centuries, G. biloba was cultivated by Chinese Buddhist monks in monasteries, which ensured its preservation. It is planted in public spaces because it is unusually resistant to pollution. Male and female organs are produced on separate plants. Typically, gardeners plant only male trees because the seeds produced by the female plant have an off-putting smell of rancid butter. Ginkgo. This plate from the 1870 book Flora Japonica, Sectio Prima (Tafelband) depicts the leaves and fruit of Ginkgo biloba, as drawn by Philipp Franz von Siebold and Joseph Gerhard Zuccarini. The phylogenetic position of the gnetophytes is not currently resolved. Their possession of vessel elements suggests they are the closest relative to modern angiosperms. However, molecular analysis places them closer to the conifers. The three living genera are quite dissimilar: Ephedra, Gnetum, and Welwitschia ((Figure)), which may indicate that the group is not monophyletic. Like angiosperms, they have broad leaves. Ephedra ((Figure)a) occurs in dry areas of the West Coast of the United States and Mexico. Ephedra’s small, scale-like leaves are the source of the compound ephedrine, which is used in medicine as a potent decongestant. Because ephedrine is similar to amphetamines, both in chemical structure and neurological effects, its use is restricted to prescription drugs. Gnetum species ((Figure)b) are found in some parts of Africa, South America, and Southeast Asia, and include trees, shrubs and vines. Welwitschia ((Figure)c) is found in the Namib desert, and is possibly the oddest member of the group. It produces only two leaves, which grow continuously throughout the life of the plant (some plants are hundreds of years old). Like the ginkgos, Welwitschia produces male and female gametes on separate plants. Watch this BBC video describing the amazing strangeness of Welwitschia. Gymnosperms are heterosporous seed plants that produce naked seeds. They appeared in the Paleozoic period and were the dominant plant life during the Mesozoic. Modern-day gymnosperms belong to four phyla. The largest phylum, Coniferophyta, is represented by conifers, the predominant plants at high altitude and latitude. Cycads (phylum Cycadophyta) resemble palm trees and grow in tropical climates. Ginkgophyta is represented today by a single species, Ginkgo biloba. The last phylum, Gnetophyta, is a diverse group of plants that produce vessel elements in their wood. (Figure) At what stage does the diploid zygote form? (Figure) B. The diploid zygote forms after the pollen tube has finished forming, so that the male generative nuclei can fuse with the female gametophyte. Which of the following traits characterizes gymnosperms? The plants carry exposed seeds on modified leaves. Reproductive structures are located in a flower. After fertilization, the ovary thickens and forms a fruit. The gametophyte is the longest phase of the life cycle. Megasporocytes will eventually produce which of the following? What is the ploidy of the following structures: gametophyte, seed, spore, sporophyte? The Mediterranean landscape along the sea shore is dotted with pines and cypresses. The weather is not cold, and the trees grow at sea level. 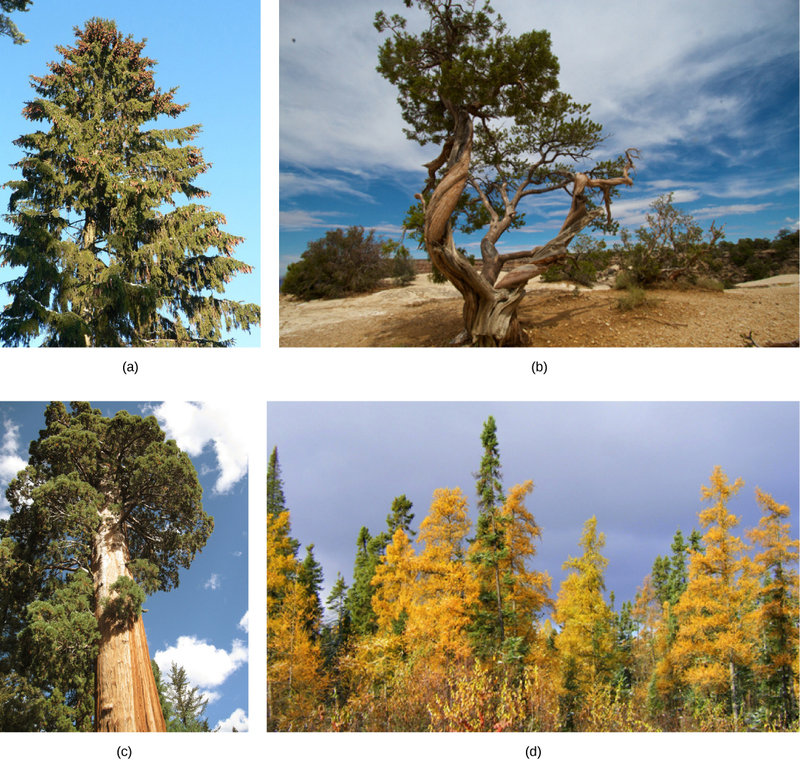 What evolutionary adaptation of conifers makes them suitable to the Mediterranean climate? The trees are adapted to arid weather, and do not lose as much water due to transpiration as non-conifers. What are the four modern-day phyla of gymnosperms? The four modern-day phyla of gymnosperms are Coniferophyta, Cycadophyta, Ginkgophyta, and Gnetophyta. Gymnosperms by OpenStax Biology 2nd Edition is licensed under a Creative Commons Attribution 4.0 International License, except where otherwise noted.